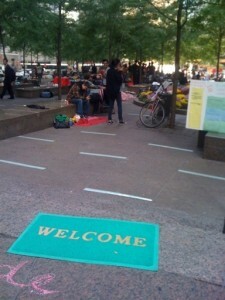 A welcome mat at Occupy Wall Street's Liberty Plaza on September 21, 2011. Sometimes people ask me to tell the Occupy movement it should do this or that. It’s tough to know what to say, since the movement doesn’t exactly respond to advice from the outside. How could it? This is a participatory, relationship-based community. No one person really is in control, so it’s not like I can just pass some nugget of wisdom on to the secret leader. (Believe me, I’ve tried.) If you want a certain idea to get internalized in the movement, the best advice I can give is to participate yourself. Join relevant committees, be patient and try to persuade people there. Have fun. But be warned: you’ll probably change your mind in the process. Also, there is a lot more room now (in “Phase II”) for active collaboration between the movement and existing organizations. See my post on the Occupy Our Homes action for an example of this. So another means of having your way with Occupy is to come to the table (or, really, the working-group circle) with some resource or activity to offer through an existing organization. Chances are, unless they smell corruption, the occupiers will be happy to back it up. And, of course, the more you hang out with them, and listen to their ideas, the more invested they’ll be in doing so. Lastly, you can always just start your own Occupy based on the idea you have. After all, “Occupy Everything.” Get a group of people together, get them talking about the idea, and listen to what they have to say. Start taking action. See where it goes. No matter what, don’t sit around and wait for others, whether in the movement or in power, to do for you what you think is right. If Occupy means anything, it means the power is already yours, and it’s up to you to occupy it. All this is actually quite simple, though considering the upside-down way we’re used to the world working, it can seem hard to grasp.